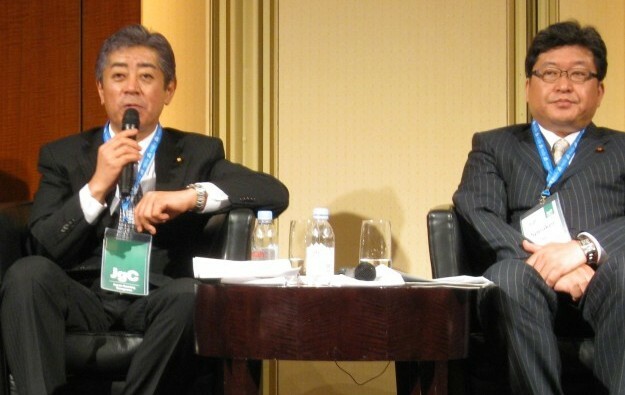 Koichi Hagiuda (pictured, right), a special adviser to Japan’s prime minister Shinzo Abe, told the opening session of the Japan Gaming Congress in Tokyo he “wanted to correct a misunderstanding” about casino resorts being open in time for the 2020 summer Olympics. He said: “It [linkage to the Olympics] was just to give us the momentum.” Mr Hagiuda added that there was currently a backlog of legislation for the cabinet office to deal with. Sakihito Ozawa, a member of the House of Representatives for the Japan Restoration Party, warned it would be “tough” to pass the the initial enabling bill by the end of the current Diet session in five weeks. “It has to pass the upper house, and they behave differently to the lower house. The current session ends on June 22 and the bill must be passed 20 days before the end of the session – which means the bill would need to be submitted by the end of May,” said Mr Ozawa.